I’ve seen some amazing photos of Kendrick Peak. It’s the second-highest peak near Flagstaff and boasts some amazing views, and a meadow thick with tall grass and ferns. 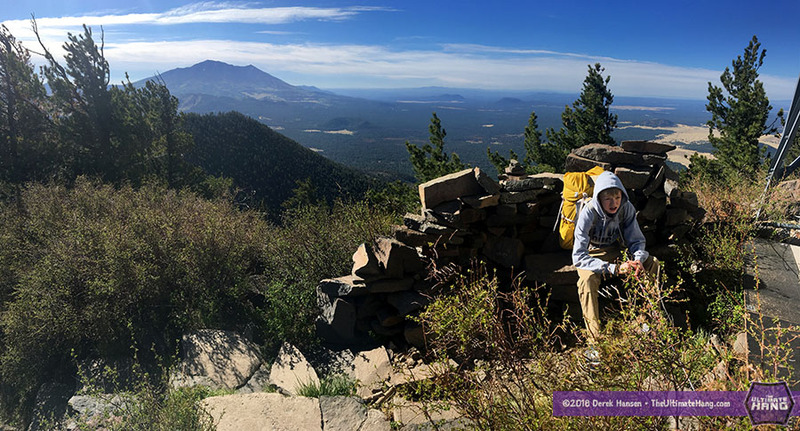 It was late May, 2018, and I had a “free” weekend, so inspired by my friend te-wa’s adventures and stories, I recommended to my son that we do a quick overnight hike and see how it compares. A few days before our planned excursion, I was having dinner with a family friend who happens to be the local forest ranger. After asking his opinion about the trail he validated my expectations, “it’s my favorite hike in Flagstaff,” he exclaimed. But he immediately shifted and continued, “that is, it was, up until the recent forest fire.” I questioned him and as he described the burn area, worried that my dreams were all but destroyed. However, after probing him further, I was convinced that the burn didn’t extend to the location I was planning to camp. “Surely,” I said to myself, “the meadows are safe.” I figured we would hike through some burned areas, but had high hopes of hanging above sweet ferns, meadow grasses, and wildflowers. The day of the trip arrived, but we got off a few hours later than I hoped. One of the delays was picking up some last-minute gear. The forest service had implemented strict rules about fires and stoves earlier than hoped, and since I usually pack ultralight, with just a simple cat food can alcohol stove, I had to get something with a legitimate “off” switch. Thankfully a local outfitter had some really nice, lightweight canister stoves for less than $10. I bought two. A few other odds and ends and we were off, with a slight detour to pick up a trail dinner—Fiesta Pack from Del Taco! With the sun already nearing the horizon when we stepped onto the trail, I knew a sit-down dinner was off the table. Kendrick Peak Trail #22 is listed at just shy of 4.6 miles (7.4 km) one way, with an elevation gain of 2,639 ft (804 m). While it doesn’t seem like a difficult hike, we found it relentless. There were no real flat areas to stretch out your legs, just one long uphill slog. I’m sure that hiking in the dark made it worse, especially being a new trail to us. Knowing there wasn’t any water on the trail, I packed enough to get us up, camp, breakfast, and down without refilling. It means a lot more water—and weight—than I like, but still at a lightweight pack load of around 20 lbs, each. I was hoping for overnight temperatures in the mid-40s°F, so we packed accordingly. As we neared the summit, we hit the switchbacks—and wind—an environmental condition I wasn’t anticipating, but not totally unexpected. Winds in Flagstaff can be fierce, but are usually strongest during April and October. This late in May the winds had really died down, so I attributed this change to thermodynamic shifts with the sun going down. I’d experienced similar shifts on a trek I took in Southern Utah. Once the temperature equalized, the winds would stop, or so I told my son. However, the winds didn’t stop, or relent, in any way, and as we finally crested and stepped into the meadow, we were blasted by the full brunt. It was gale-force. And I worried about my tarp. Thankfully I knew a little about setting up camp in the wind. We wandered around for a bit looking for a sheltered spot, just off the crest on the leeward side. Our chosen spot was nestled behind a great screen of bushes and low fir trees. We could hear the wind bellowing in rage above us, but we only felt a little tickle now and again. I praised myself for being such a good Boy Scout. Sadly, my pride was dashed when my son revealed he forgot to pack his hammock straps. My mind raced, but I wasn’t altogether worried. I figured we could MacGyver the situation using what gear we had on hand. I felt a little apprehensive, however, when I found my only option was my strap set with Dutchware Whoopie Hooks and Whoopie Slings—not ideal for slinging up two hammocks. After debating internally whether one of us should try sleeping on the ground (heresy! ), I repented of the thought and decided we would hambunk (after all, how could I face the world and admit defeat at not being able to rig two hammocks with a single suspension set?). The hooks are rated to 1,000 lbs (454 kg), so I felt confident in their holding power. Both hammocks were fitted with continuous Amsteel loops that fit easily over the hooks. We had two 11-foot hammocks, both with bug nets and ridgelines. In order to make this work, I had to remove the ridgeline from the lower hammock and hang it with a less-than-ideal angle. My son drew the bottom bunk, but as he was slightly shorter, it seemed a good compromise. We were both pretty tired after the long hike and late hour, so we went right to bed. It didn’t take long for me to realize I had forgotten another critical piece of gear: ear plugs. One of my biggest pet peeves is laying in a hammock, completely comfortable, but unable to sleep. I struggled in vain to shut out the noise from the wind screaming across the mountain, rattling the trees, and shaking our tarp. To make things worse, it was a lot colder than anticipated, just above freezing. We were both wearing all our extra clothing to bed just to stay warm. By morning, I was broken. With scattered sleep, I decided I might as well just get up with the dawn. Thankfully my son still slept. I threw my 40-degree top quilt over him for added warmth while I wrapped up in my 20-degree under quilt to prep breakfast. I cooked our favorite treat: fresh-baked muffins. When he arose, he scored breakfast in bed while I cleaned up. The burn area was larger than I hoped, scouring even the top of the meadow. We were presented with wind-swept tufts of dried meadow grass and burnt pine. For a consolation, we decided to check out the summit. It’s a short but steep hike up to the lookout tower. Next to the tower is a cement helipad that afforded views around the entire area. The views nearly made up for the sleepless night, but we both agreed to fast pack down to the car so we could get home and crash. Which we did.